A beautiful, straight smile boosts an individual’s self-esteem and impacts his or her personal and professional lives. Teens and adults who wish to straighten their teeth may be turned off at the thought of conventional metal brackets and wires. The metal braces are immediately noticeable and may cause embarrassment for those who are already self-conscious about crooked or gapped teeth. At Bingham-Lester Dentistry, we offer Invisalign braces to patients in Crofton, MD and the surrounding areas. Invisalign trays are a popular way for patients to get orthodontic benefits without visible brackets. Custom created – Aligner trays are created using impressions of the patient’s teeth to ensure a proper design, fit, and result. Comfortable – With traditional braces, tightening the wires changes the pressure on the teeth to move the teeth into proper alignment. This can be uncomfortable or painful for a few days. 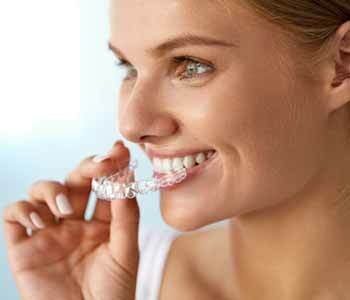 Invisalign trays are made of comfortable, transparent plastic. They use gentle pressure to shift the teeth. Changing pressure – Patients receive a series of aligner trays, each with a different placement of pressure. The changing pressure is gentle, but it continually moves the teeth into the proper alignment. Removable – Patients can remove the trays as needed to eat and to care for their teeth. Invisible – Made of clear, BPA-free plastic, Invisalign trays are not noticeable. Since Invisalign braces are removable, patients bear the responsibility of wearing them as directed. When worn as directed by the dentist, patients increase the chances of a better result. Wearing the trays as recommended ensures a positive outcome and decreases the possibility of expenses for future orthodontic work. If the trays are not worn, they will not effectively straighten the teeth. If you live near Crofton, MD and are interested in straightening your teeth without conventional braces, contact our office to schedule your appointment with Dr. Bingham-Lester today. Call 410-885-6522 .